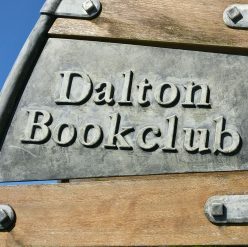 In 1764 seventeen men of Dalton-in-Furness and the surrounding district met in the White Horse Inn, then the house of Mr Thomas Taylor, and drew up the “Rules and Directions” of what was to become The Dalton Book Club. The members have met every month since that date, leading to their claim to be the oldest book club still in existence. Membership is limited to thirty, and by tradition the thirtieth place is kept vacant for the son of an existing member. Members again meet at the White Horse Inn, currently at 8pm on the fourth Wednesday of the month, meetings having been held in various locations over the two hundred and fifty-four years of the club’s existence.